The ''massive'' Procurement Arrangement signed with the US Domestic Agency covers the manufacturing of several hundred pumps of different sizes and technologies, valves, supporting structures and connections. The presence of representatives from the ITER Members for meetings of the Management Advisory Committee last week was also the occasion to advance the ITER Organization's procurement agenda: during "MAC week" Procurement Arrangements were successfully finalized with the United States, China and Korea. 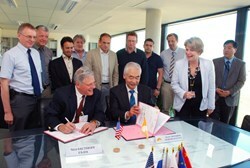 In order to conclude the Procurement Arrangement for Standard Components, Vacuum Auxiliary Systems with the United States, a "massive" amount of work was accomplished by the vacuum team comprising ten people from the ITER Organization and five from the US Domestic Agency, according to ITER Vacuum Section Leader Robert Pearce. This Procurement Arrangement—the first to be signed with the US Domestic Agency this year—covers the manufacturing of several hundred pumps of different sizes and technologies, valves, supporting structures and connections. "It is massive in terms of complexity—it is a highly distributed system that interfaces with about every part of the machine," says Pearce. "And it is also massive due to the sheer number of individual components that have to be produced, assembled, tested and delivered." 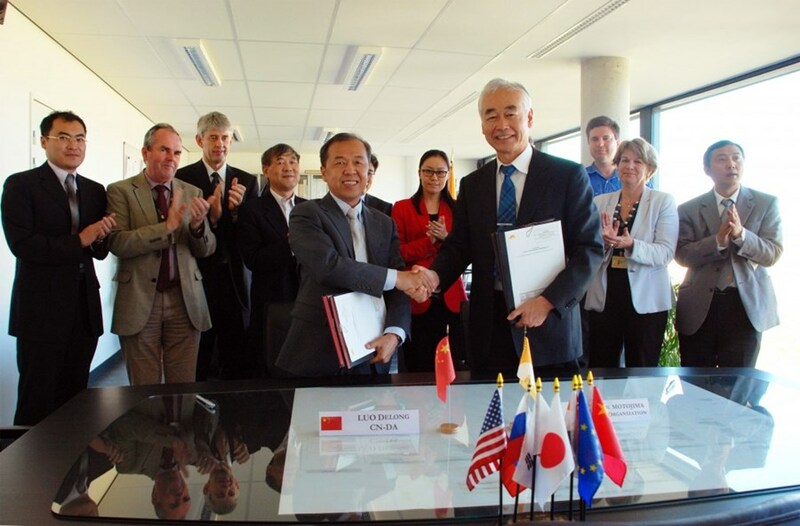 The ITER Organization signed a Complementary Diagnostic Procurement Arrangement with the Chinese Domestic Agency for the supply of the radial X-ray camera diagnostic for monitoring x-ray emission on ITER and another for equatorial port #12, including integration. This brings to 85 the number of Procurement Arrangements signed by the ITER Organization to date out of a total of 140 planned work packages, not including about 45 Complementary Diagnostic Procurement Arrangements. Each Procurement Arrangement represents the transfer of work from the ITER Organization to the Domestic Agencies. Three Complementary Diagnostic Procurement Arrangements were signed last week, two with the Chinese Domestic Agency and one with the Korean Domestic Agency. 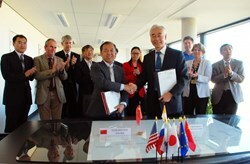 China will supply equatorial port number 12 and a radial X-ray camera diagnostic for monitoring x-ray emission on ITER. Korea will supply upper port number 18. These Procurement Arrangements comprise complete port integration, including port plug, post interspace and port cell structures, diagnostics and services. The integration is a very important and challenging task which is required to ensure the proper functionality of all integrated systems, and diagnostics in particular, as well as to fulfil demands of safety, maintenance and handling. The MAC week was a productive one: the Korean Domestic Agency signed a Complementary Diagnostic Procurement Arrangement for upper port #18 and integration, completing the Korean diagnostic scope. The x-ray camera installed in equatorial port plug 12 consists of in-port and ex-port modules that are based on similar cameras on other machines, particularly JET. The hot plasma core is a strong source of x-rays. These x-rays carry information about the radiated power, electron temperature, plasma position, and plasma internal motion. Upper port 18 contains the vacuum ultra violet spectroscopy system already undertaken by the Korean Domestic Agency and completes the Korean diagnostic scope.